In 2003/04, MREAC was successful in its partnerships to achieve an opening of 10 sq. km of rich oyster habitat on the Miramichi estuary. Since then, MREAC staff continues to target an additional area of approximately 10 sq. km. MREAC originally flagged shellfish habitat as an issue in 1992 in a State of Environment report. In 2001, MREAC developed a strategy to address the problem with the intent of opening up to 34 sq. km. The economic benefits of opening formerly closed shellfish areas have also been studied with assistance from research partners. The sustainable economic benefit of this wild stock is very significant (i.e. >$50K per annum) and has not included the potential to be realized in shellfish aquaculture. Besides water quality standards, shellfish meat is tested by the Canadian Food Inspection Agency. Working in partnership with Environment Canada, MREAC staff collected water samples and tested for E. coli in house. As shellfish are consumed by humans, the water quality standards limit have increased from 12 CFU/100ml to 0 CFU/100ml of E. coli. If water samples exceed this limit, the area is considered unacceptable for shellfish harvesting. 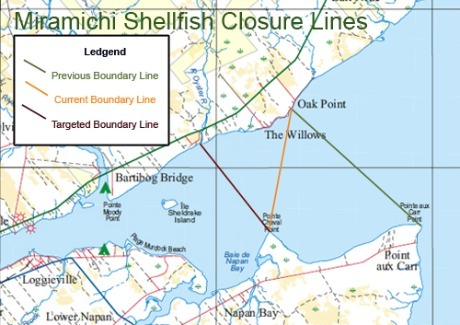 Several samples continue to exceed this limit, causing the area of the shoreline to continue to be closed to shellfish harvesting. MREAC continues to investigate the issue in hopes to understand the situation and find the source of the bacterial contamination.